Raynaud's disease tends to dry out the skin, causing it to crack and break if you don't follow the correct treatment plan. The Gloves in a Bottle 240ml SPF 15 Shielding Lotion is designed to moisturise and protect your skin, which helps improve your current condition while also preventing further damage. This particular bottle also protects against ultraviolet rays, making it ideal if you suffer from secondary Raynaud's disease and an associated condition like lupus. This version of Gloves in a Bottle SPF 15 Lotion is 100ml in size, allowing you to take it around with you while you're on the go. The bottle of lotion fits into most bags, so whether you're going to the beach, making a home visit to a client, or meeting friends, we've got you covered. If you'd prefer a larger bottle, the Gloves in a Bottle 240ml SPF 15 Shielding Lotion is available to purchase separately. 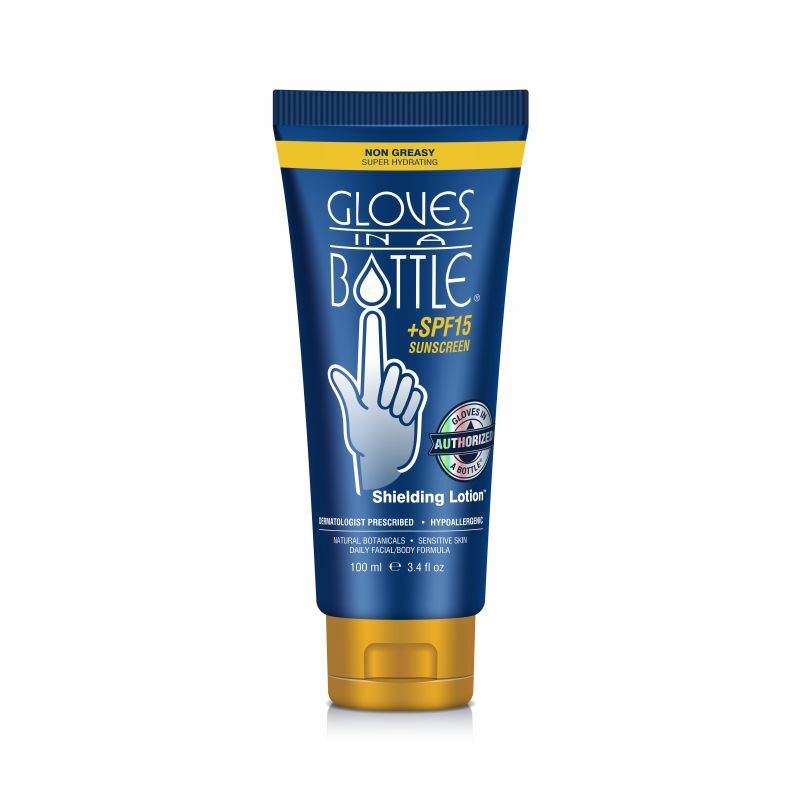 Gloves in a Bottle SPF 15 Shielding Lotion includes sunscreen to ensure you remain protected against the sun, making it an excellent cream for those who suffer from lupus and secondary Raynaud's syndrome. As the lotion helps to improve drying skin conditions, it prevents embarrassment while also reducing the likelihood that you will suffer from skin damage. As you tend to wear lighter clothes in the hot weather, you might feel more self-conscious about your condition, which is why this lotion is such an excellent solution to your needs. How Does Gloves in a Bottle 100ml SPF 15 Lotion Work? 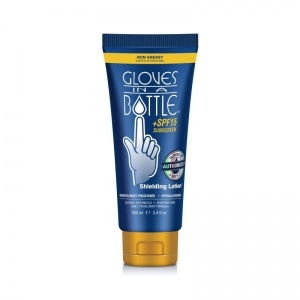 Gloves in a Bottle Shielding Lotion works by creating a protective, waterproof "shield" with the outer layer of the skin. This shield remains in place for up to three hours to retain the natural oils and moisture in the skin while also protecting your body against external irritants. Unlike most moisturisers, this lotion won't wash or rub off when you wash your hands or perform hand-intensive tasks. In fact, this moisturising SPF 15 Shielding Lotion actually enhances the ability of your skin to retain more of its own oils, which is more effective than simply masking the issue for a short period of time. The lotion instead comes away from the skin as your cells are naturally exfoliated. How Do I Apply Gloves in a Bottle? Apply a pea-sized drop onto clean, dry skin and rub in well. After approximately 30 seconds, the lotion will be completely absorbed into the outer layer of skin cells. Feel the difference Gloves in a Bottle makes to your skin! As skin cells naturally exfoliate, the lotion will come away from the skin. Not only does this product protect against chemicals and other irritants, but it also improves skin conditions and dryness. Take a look at the difference Gloves in a Bottle has made in just one month below or read the full Case Study here. What's in Gloves in a Bottle SPF 15 Shielding Lotion? Please note that it is advised Gloves in a Bottle is not used on open wounds; please wait for your wounds to heal prior to application. If you suffer from lupus, this lotion should not be used instead of a high SPF lotion. Please note, RaynaudsDisease.com is dedicated to maintaining the highest levels of hygiene for all of its products and for this reason this item is non-refundable and non-returnable if unsuitable or unwanted on grounds of hygiene. If you have any questions regarding this returns policy, please contact our RaynaudsDisease.com Customer Care Team on 020 7720 2266 for further details. This product is normally dispatched by 1st Class Royal Mail. Delivery costs are £9.99 including VAT for delivery of all items to Europe. Please note that certain islands and territories may incur an additional freight charge. Delivery costs are £14.99 including VAT for worldwide delivery. Please note that certain islands and territories may incur an additional freight charge.